Here with one of the coolest kids I ever had the privelage of teaching, tristan! Hey y'all, Coach Dylan here! First, thank you for taking the time to check out Nova Mente, looking at the site, and learning about who I am and what I'm all about! I appreciate you and can't wait to see here on the mats with me! I earned my Blue Belt in one year and my passion for Jiu Jitsu intensified daily. I once heard a wise man say, "If you want to be the best at anything, train and mentor under the best." So, I made the move to Dallas to train under 8th degree Black Belt Master Carlos Machado (a nephew of Carlos Gracie). It was here that my game took off to a level I could not have imagined. Training multiple times a day, helping out around the Academy, constantly pestering Master Machado to teach me more and more. I was in Jiu Jitsu heaven! I was young with no real responsibilities and a desire for knowledge. Still true to today, well, besides the young part! I started my Jiu Jitsu journey on February 15th, 2007, when I was 19 years old. Wow, has it been that long? I went and finally tried a class after a friend hounded me for more than month about this "Jiu Jitsu stuff". I sure didn't know what I was getting myself into! I finally caved and decided to try a class. I was hooked immediately. It's common to hear people talk about how quickly they fell in love with Jiu Jitsu, and it's safe to say that was true for me, it was love at first sight. I remember feeling nervous before my first class, I was tall (6'1), but wasn't overly athletic, and was small for my height weighing, only 145lbs. But boy did I have a mouth on me! Little did I know, Brazilian Jiu Jitsu was going to transform that and much, much more! In my first class, I was quickly amazed at how I could use leverage, angles, and technique to control much larger opponents. I became obsessed with mastering the techniques shown in class, and soon filled up all my time with training, learning, and helping out around the Academy teaching new White Belts. Reffing a f2wbjj.com tournament in denver, Co in 2017. Love being the ref for kids! While training with Carlos, I received my Purple belt, having only spent 1.5 years as a Blue Belt. I continued to teach and instruct. Eventually my passion for teaching led me to open my first school with a fellow Purple Belt in Mansfield, Tx. The school was called Champion Jiu Jitsu and Mixed Martial Arts (MMA). We worked to make it successful and I learned a tremendous amount about myself during that time. One of those things that I learned was that I still had a desire to expand my Jiu Jitsu knowledge! So, I sold my stake in the business. Champions later became Gracie Barra Mansfield and continues to empower people today! After selling Champions, I moved to Houston, TX, to train under Vinicius Magalhaes (also known as, Draculino), a 5th Degree Black Belt under Carlos Gracie Jr. There I also had the privilege to train alongside Professors Brandon Mullins and Pablo Silva. This is where I developed a unique and different style of guard. Playing Jiu Jitsu with these lighter instructors changed how I moved and the leverage points that I used. It was phenomenal! I am fortunate for my time there and for what Professor Draculino has and is doing for the Jiu Jitsu community in the United States! After training their for a while, I received a call that my father had fallen ill, and I returned home to help him run the family electrical business in SE New Mexico. Luckily, there was a Nova União Association Black Belt, Professor Bruno Bastos, who had a school a couple hours a way, where I would drive to go train 4-5 days a week. That's right, I drove 4 hours a day to train with Professor Bruno three - four days out of the week. It was totally worth it. I mean if you are committed to something, doesn't it make sense to do what it takes to fulfill that commitment? World champions train at Bastos BJJ in Midland, TX, and I saw a massive improvement in my half-guard game. It was under Professor Bruno that I had some of the biggest breakthroughs in my competitive mindset while competing under their tutelage. 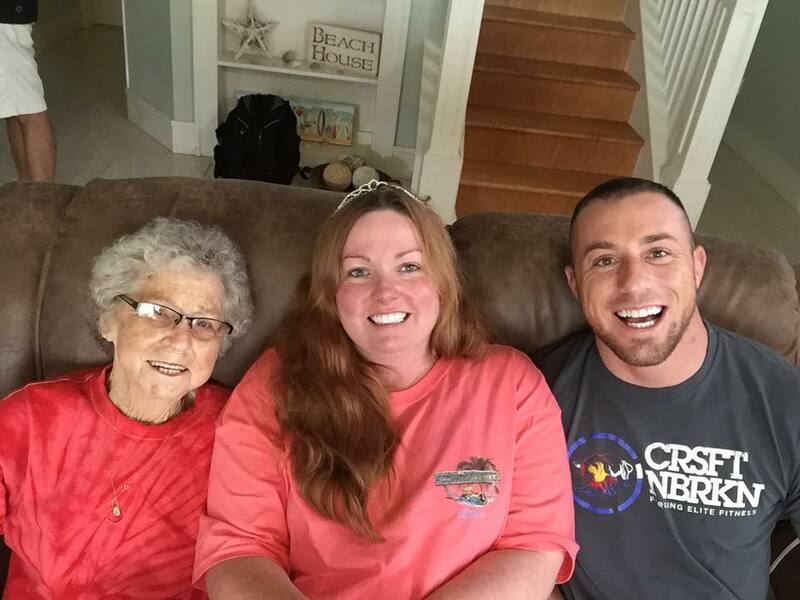 Here having fun with my Cousin and my Grandmother who I lost in 2016. I am so thankful for my Granny as she set an example for me to live up to And is one of the reasons I opened this Academy. I am doing my best to make you proud! My Jiu Jitsu journey then brought me to the beautiful State of Colorado. I searched around for a school to continue growing in Jiu Jitsu, and was very fortunate to meet Professor Steve Hordinski at Relson Gracie Jiu Jitsu Colorado, which is now Katharo Training Center. We agreed to work alongside one another to grow the business, which I learned a great deal from in the process. Along the way, Katharo became an affiliate of Master Carlos Henrique "Caique" Elias, a 7th degree Red and Black Corral Belt under Grandmaster Helio Gracie. Master Caique is 1 of only 8 non-Gracie's to recieve his Black Belt from Master Helio. It was here, after time as a Purple Belt, that I earned the rank of Brown Belt in 2014. The training at Katharo was awesome. While at Katharo, I felt the need to give back to my community and country in a deeper way. This feeling led me to enlist in the Colorado National Guard. I previously served in the Texas National Guard from 2007 to 2009. I am honored to be a member of a team and serve with my Infantry brothers. Serving in the Colorado National Guard brings me great pride and honor. I love my Army family. I support our military. This love is why have raised each branch's flag on the walls of our gym. here with two of my biggest champions in life and the best parents a guy could ever ask for, my mom and Dad! Thank you for all you have done for me! Teaching with Uke Coach Kyle before we officially opened the doors! Shortly after my return from 6 months of training with Colorado National Guard, I got the itch to settle down somewhere in Colorado, and begin teaching Jiu Jitsu again. I spent several months looking for the ideal location. Building after building, unit after unit, I hunted all over the greater Denver area. Finally, I found a building here in Englewood/Sheridan. We opened the doors on May 1st, 2017, and I couldn't be more excited to share my Jiu Jitsu with all of you. I am committed that you leave here each day feeling empowered, and confident. I am choosing to take a stand that all of you who are willing to put your trust in me will experience a transformation in your life. My goal is not just to teach you great Jiu Jitsu, but to equip you with the tools necessary to transform, and change the lives of those around you and in your community, and help you be the best version of yourself at whatever it is your up to. So really, thank you. Thank you for taking the time to check out the Nova Mente Jiu Jitsu website and thank you for expressing interest in Gracie Brazilian Jiu Jitsu. I am privileged to have an amazing life, group friends, family, and know myself as a much better person because of the Martial Arts. If you are interested in trying out a class, please give us a call at (303) 209-1830 for a free introductory lesson! I would love to share the mat with you and let you see the difference Jiu Jitsu can make in your life.